For some years now I’ve suffered from Reynaud’s , normally it’s something I can cope with by bundling my hands up in fat Norwegian mittens and drinking something warm and milky… I’ve got quite long fingers which mean I generally manage to poke the tips out of gloves with fingers so mittens are much favoured. However when I’m trying to hand sew patchwork then the mittens aren’t really an option. When an attack happens, and this can occur in the midst of Summer when it’s all hot and sticky. Maybe the sun goes in behind a cloud, or I’ve had a cold drink or ice-cream but suddenly my “inner thermostat” starts dropping and my fingers and hands, toes and feet start tingling and going numb. It’s quite painful and looks awful as my fingers and toes turn waxy white (they look like something rejected from Gt Yarmouth’s House of Wax museum and if you are local you know they must look a proper fright)…holding a needle to sew with is out of the question, often it’s all I can do to thumble about, pulling on mittens before trying to make a warm drink (milk and honey seems to be the best, though I think it’s because that relaxes me)…keeping my hands warm means the world of difference to me. 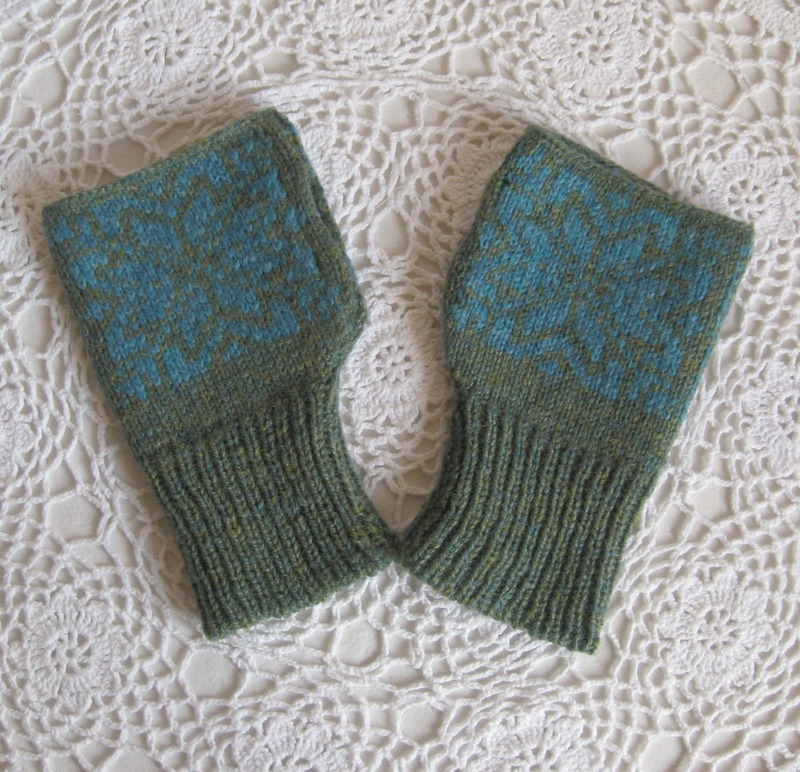 I knitted a pair of fingerless gloves a couple of years ago and they are okay, but are a bit bulky (they were knitted in rib and are a bit on the loose side) I’ve lost count of the times I’ve managed to sew them into my patchwork…..anyway, back in November I saw some beautiful fingerless gloves on Ella Gordon’s blog *(she also knits gorgeous cushions which I’d love to have piled up on the sofa but Bernard is such a plucky paws I know they’d literally end up looking like something the cat has played with within days) and felt my heart quicken as I fell in love with them….. 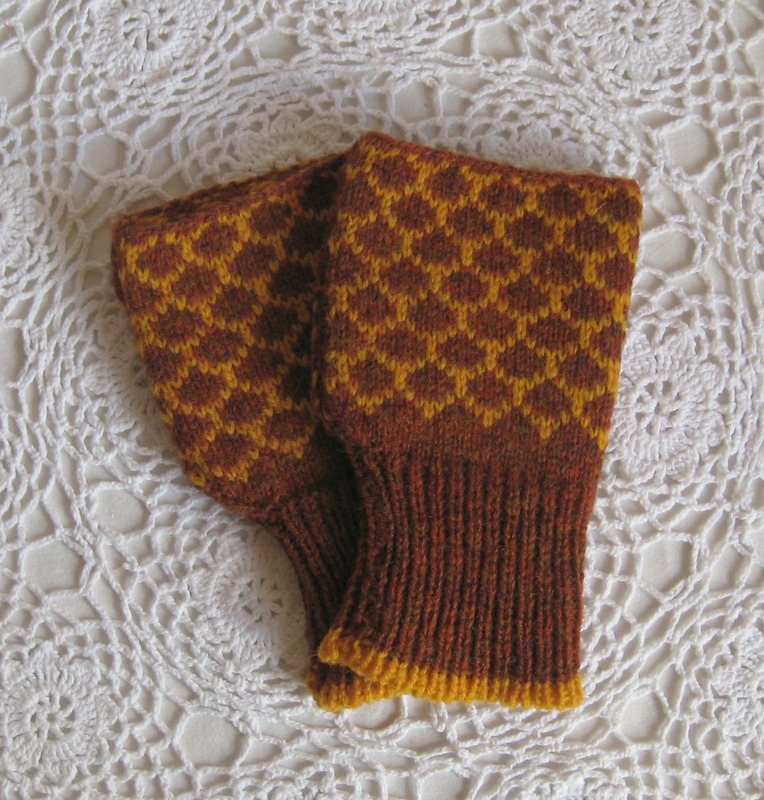 Anyway, the Reynaud’s has been particularly bad lately (I’ve even worn gloves when I’m ironing which must look pretty daft) so I decided a pair of Ella’s gloves would be like a Nanny’s glass of fortified wine or sherry in the evening (purely medicinal!) …. I really like bright colours together and pink,red and orange* is a particular favourite at the moment, however I’m aware that those colours aren’t everyone’s cup of tea and wanted to spare Ella eye pain while she knitted these, so I opted for blue and green… I’m so pleased with them and have worn them everyday. The gloves have an eight pointed star on the front (a pattern I’ve been playing with while designing patchwork for a quilt) and fit beautifully. They don’t come up too high so don’t catch while I’m sewing, and are carefully shaped at the base of the hand so they fit “like a glove” as they come up the side of the thumb. I’ve worn them while sketching and they were lovely and comfy. 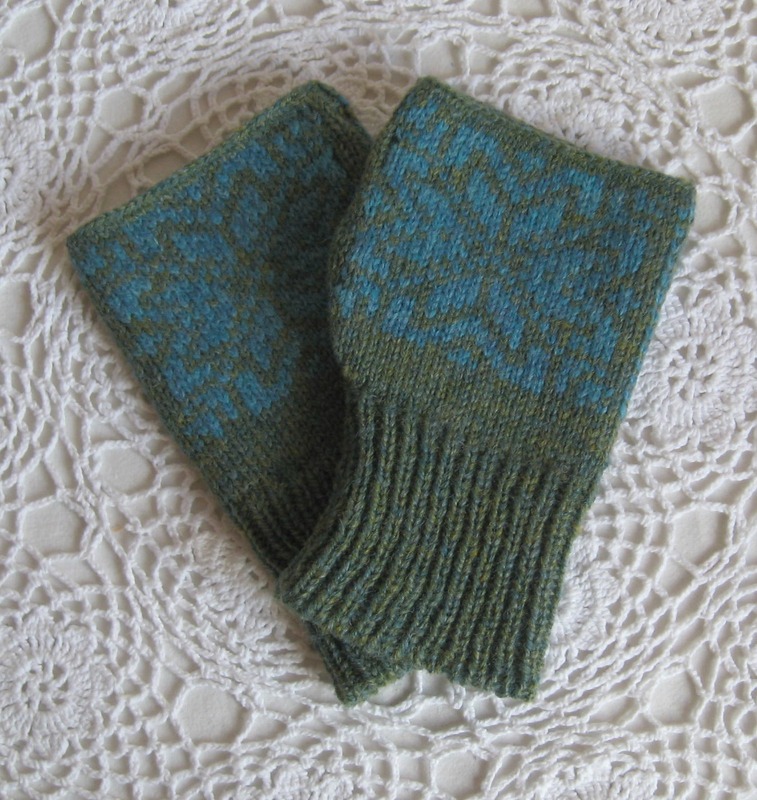 They are incredibly warm and soft… and match my blue and green crocheted granny square scarf a treat. A few days after I’d contacted Ella saying which colours I liked I saw a collection of her yellow and orange wools on Instagram and I then thought the gloves would actually look rather nice in those colours too…..Ella had already knitted the gloves but not yet posted them so I quickly put in an order for a mustardy gold pair too…like I say, they are purely medicinal, and not a fanciful wardroom purchase**. I wore the mustard ones on Monday in the city and received so many nice compliments on them. *For those of you who don’t know, Ella is an incredibly talented knitter who lives in the Shetlands (she works at Jamieson and Smith) and was one of the artists featured on their recent program about knitting in the Shetland Islands. Inspired by the landscape and heritage of where she lives, she machine knits gorgeous Crofter’s Hoose cushions which are then filled with wool. Her collection of traditional Shetland knits is stunning and a few months ago, she collaborated with Kate Davies on a jumper base for a yoke to then be knitted to. **okay, yes two pairs was a treat but they are both so beautiful and I figure if one pair is in the wash then I can wear the others…..